Sanskrit Jazz is the wedding/special event band for the SPIRITUALLY minded. We sing uplifting music infused with healing vibrations of the ancient language of Sanskrit, which was designed to harmonize with and energize the body on the physical and astral planes. The full 5-piece band instrumentation is tabla, guitar, acoustic bass, harmonium and 3 voices (one male, two female). We are also available as duo or trio, and, we are also comfortable doing instrumental music only without the mantras. 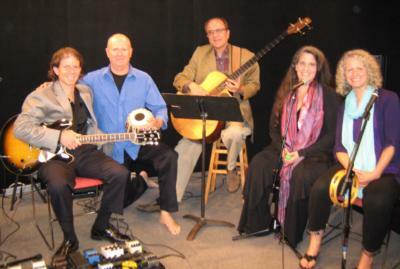 We are a modern-sounding ensemble whose music is influenced by jazz and by kirtan (sacred chanting.) The lyrics celebrate the Divine, but we are not a "religious" band. In fact, we honor all religions. and consider our music to be "omni-faith." That is, if you are of a particular faith, we embrace that and respect that as your path, and we also respect paths that may be spiritual even if they are not religious. Sanskrit Jazz is a beautiful, uplifting way to infuse your gathering with spiritual energy. You and your guests will feel relaxed, refreshed and invigorated. The full 5-piece band instrumentation is tabla, guitar, acoustic bass, harmonium and 3 voices (one male, two female). We are also comfortable as a duo or trio, and as an instrumental configuration without the voices. The founder of Sanskrit Jazz is Damodar Das (spiritual name for Dennis Winge), a full-time jazz and studio guitarist for over 10 years. He fell in love with kirtan (call-and-response Sanskrit chanting) in early 2010 and has rapidly learned much about the sacred practice. He took a week-long intensive course with Durga Das (David Newman) at Omega in Spring 2010 in which he learned how to lead kirtan as well as memorized many of the Vedic prayers as well as the 40 -verse Hanuman Chalisa. In Fall 2010 he was initiated into Kriya Yoga by Shibendu Lahiri, great grandson of Lahiri Mahashay. In 2011, Damodar Das completed a 30-hour training course with American Sanskrit Institute teacher Jo Brill, in which he learned to read 'Devanagari' (Sanskrit script) as well as understand and appreciate the nuances of Sanskrit poetry. 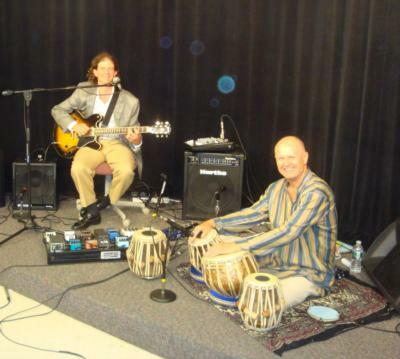 Winge began experimenting with combining his extensive jazz and blues background with the sacred sounds of Sanskrit in his kirtans, and was gradually led to explore them with tabla, acoustic bass, and 2 female vocalists, which ultimately became "Sanskrit Jazz." Tablaji (spiritual name for Cliff Hackford) has been a New York studio drummer and tabla player for over 30 years. He is a devotee of Meher Baba. Love More (spiritual name for Eileen O'Hare) is a long-time legacy carrier in Andean Shamanism & co-leader/vocalist/harmonium player of the devotional music ensemble known as "BlisSing." Cat Guthrie – voice and guitar – Cat has been a singer/songwriter/guitarist/ voice-overist for over 30 years. She is also a certified yoga instructor and forms the other half of "BlisSing." Tony Ventura – acoustic electric bass – another long-time New York studio musician, Tony's spiritual practice is putting up with the rest of the band! Please note Sanskrit Jazz will also travel to Elmira, Pine Valley, Breesport, Millport, Big Flats, Erin, Cayuta, Lowman, Pine City, Corning, Montour Falls, Beaver Dams, Van Etten, Wellsburg, Chemung, Coopers Plains, Odessa, Painted Post, Lockwood, Reading Center.